‘Welcome to the UK’s maddest city’, the message drummed into the ears of festival goers, as they prepare for a weekend of partying…Boomtown’s 2012 fair really does deliver. Opening night allows festival goers to explore the nooks and crannys of the town, giving everyone the opportunity to notice the incredible detail put into its creation. On every corner, whether it is at Town Bank or the Bad Apple Bar, uptown or downtown, music is blaring, the party is in full swing and fun is on the cards. 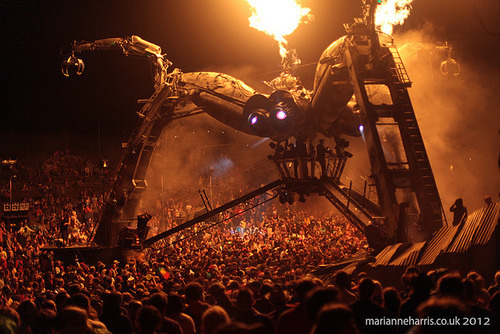 Arcadia, a large industrial spider (reminiscent of the tripods seen in War of the Worlds), has a looming presence over the town, playing to the festivals’ theme of outer space. Coming to life when darkness falls, it’s magnificent display of fire, smoke and lasers which attract the crowds, creating a weird but wonderful spectacle, perfect for a huge outdoor rave. This was stage to the likes of Shy FX, who fired out their biggest tunes, alongside cleverly timed pyrotechnics, which emphasized the music’s powerful ‘drops’, spurring the crowd on to pull out there best moves. The Lion’s Den, the home of reggae, dancehall and dub truly came to life on the Saturday. Benny Page kick started the crowd into gear with upbeat jungle sounds and underground vibes, followed by David Rodigan, who effortlessly brought Kingston Jamaica to this little British Venue. On the final night of partying, surprise guest and reggae veteran, Jimmy Cliff stole the show, playing the festival out in style. His soulful renditions of ‘Wonderful World, Beautiful People’ and ‘I Can See Clearly Now’ created a sea of swaying and singing, making the enjoyment of Boomtown hard to forget. Boomtown’s exciting vibes, small, but enthusiastic crowd and brilliant acts, created the perfect place to get away and enjoy yourself. Being an eco-friendly, child-friendly festival, it draws in an eclectic crowd offering something for everyone, including giant spiders!